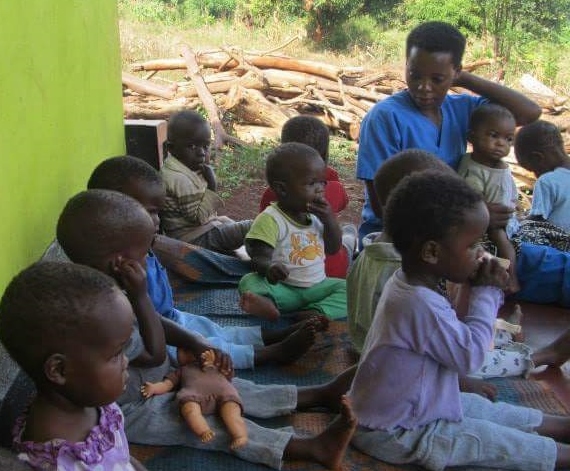 Through YOU, Hope Grafted In has richly blessed Sangaalo Babies and their new building already. We are going to continue to support them, love them, and help them reach their goals of providing the best care they possibly can. They are currently in need of a few items to continue improving their home. Damalie is looking to expand the areas of play for the children to get them outdoors. 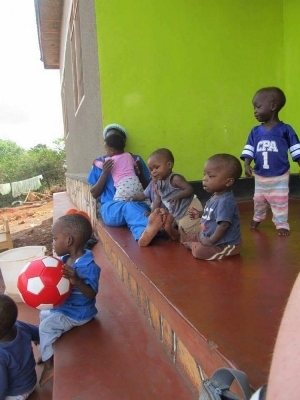 Thankfully a team from Visiting Orphans built them a playground that they can play on. But they would also like to have a covered pavilion so they can feed the babies outside and have space for the non-walkers to sit that is protected from the sun and rain but still outdoors. If you have been to Sangaalo recently, you have seen the treacherous mountain hike the little ones do to get to their playground! I had to close my eyes a few times it made me so nervous! Damalie would like to have their front yard leveled and pavers put in. This would eliminate all of the injuries they are getting know just going down to play! Of all the projects, this one is their priority.Sangaalo has been blessed to have running water in their outdoor toilets. There is no running water in the house. Damalie would like to work on harvesting water from the rains/rooftop to provide water to the house and as a back up for when the water in the toilets isn’t working. Let’s continue blessing Sangaalo Babies by donating to this campaign and helping their needs be met. Below is a list with needs and costs. We will update everyone as progress is made. Thank you and may God bless YOU in this time of giving and blessing others as well.